ePersonality: The ePersonality is a classic 4-quadrant, 16-temperament type, personality assessment similar to DiSC or Myers-Briggs. However, our personality assessment is designed exclusively for Christians. This assessment explores Ministry Temperament; how God designed us to serve Him and others. GraceGifts: Then, our GraceGifts Spiritual Gifts Test is unique in that it filters the gift reports through personality, resulting in more precise gift reporting. Leadership Style: Next, our Leadership Style Assessment helps church leaders build highly effective ministry teams. 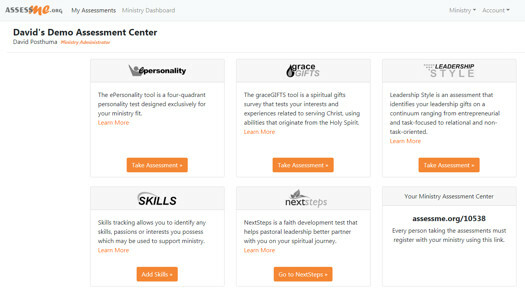 Skills Tracking: Finally, our Skills Tracking system reveals the skills God has developed within your church members. Felt-Need Analysis, Assesses 24 Felt-Need Categories that May Aid or Block Spiritual Growth. 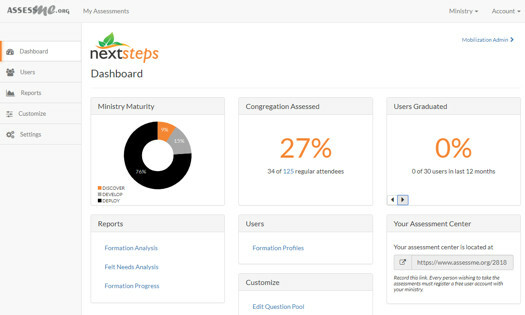 Also, Next Steps offers a third feature: Disciple Equipping Center. The Disciple Equipping Center helps manage your church’s disciple-making programs, small groups, classes, and resources. It provides a disciple-making structure and process that many churches find helpful. Next Steps is to be retaken over and over, so that it may track each person’s spiritual progress. Then, Next Steps creates Progress Reports that convey each person’s spiritual growth, stagnant growth, or spiritual decline. Finally, you may customize nearly every part of this church assessment program, including titles, question pools, and reports! We designed NextSteps to flex and fit with your church’s unique discipleship culture. To learn how to best use our Assessments within your church, please order our training book, Made for a Mission, by CLC Publications.